This is so refreshing, especially on a hot night when you don't want to make a fuss. 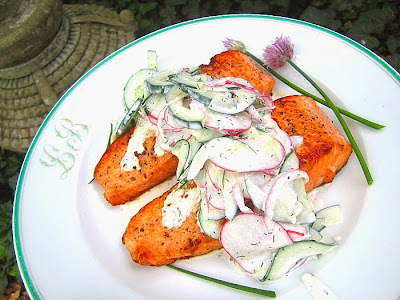 I love this cucumber salad w/ hard boiled eggs for lunch (but of course) and on top of grilled salmon for dinner. 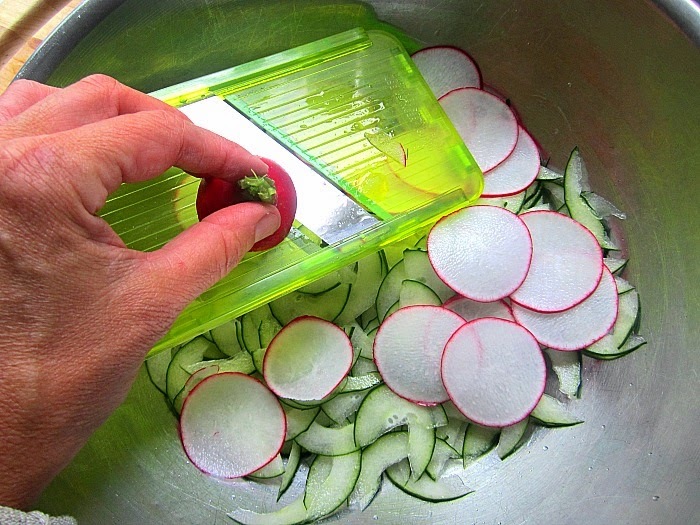 I sliced all the vegetables on a mandolin, so they were super thin, but you don't have to. The second time I made this salad, I left the cucumber pieces chunky (which I actually liked better). 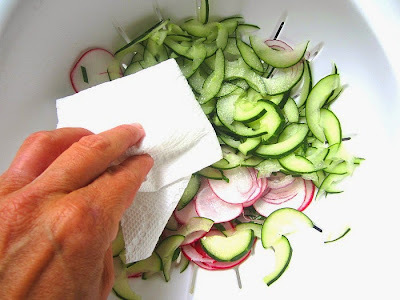 Slice the cucumber in half and remove the middle with the seeds. Place in a colander and sprinkle w/ kosher salt, let sit for 30 minutes. This will get a lot of the moisture out of the cukes, otherwise your salad will be too wet. If you are using an English cucumber (hothouse cuke), it has no seeds, so just cut into 1/2" chunks and salt to draw out the moisture. Wipe the salt off w/ a paper towel and blot the moisture. Add to a bowl with the rest of the ingredients. Mix together and refrigerate until ready to use. 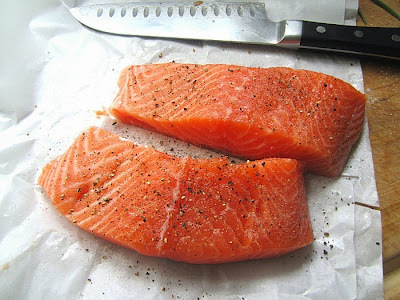 Season the salmon w/ kosher salt & pepper. Grill or pan sear for 4 minutes on each side (depending on the thickness of the fish). Top with the cucumber salad and stay cool. Loving that day-glo chartreuse mandolin! Looks so good! 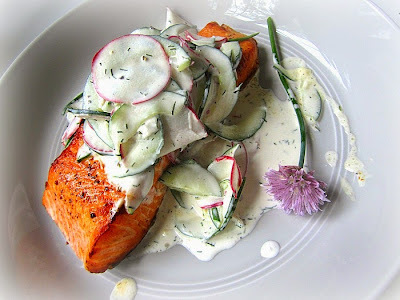 Another recipe on my list of must makes.